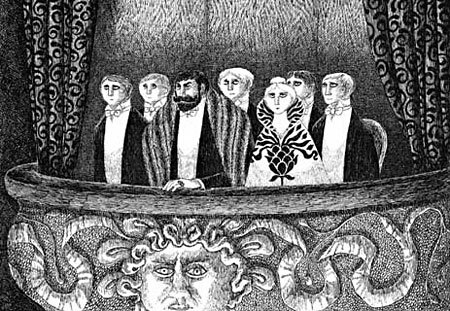 i've always wanted to do an inspiration post about Edward Gorey, one of my favorite illustrators and writers. there is something about how he combines the dark and macabre with moments of absurd hilarity that makes him so unique...Neil Gaiman (Coraline, The Graveyard Book) perhaps inherits some of the surreal and twisted legacies of Gorey in his children's books, but they're quite different. 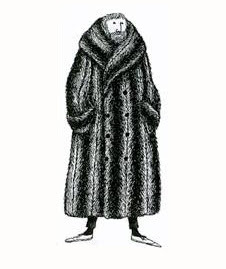 my love of Edward Gorey's illustrations in particular leads me to a little 'visual etymology' of the eccentric fur coat as it has appeared in his works, and various vintage films over the years. first off, no post about Gorey is complete without his animated opening credits to the PBS Mystery! series. i watched this all the time as a kid in the early '90s, and given my short attention span, the opening credits were usually my favorite part of the shows. but this little animated short probably started off my love of mysteries (Agatha Christie especially). 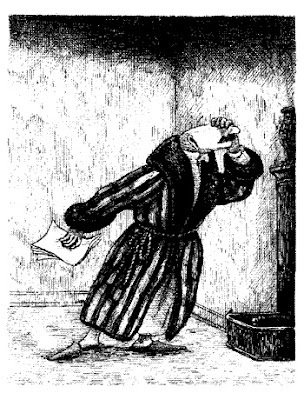 and who can forget Mr. Earbrass, the tormented writer in The Unstrung Harp? 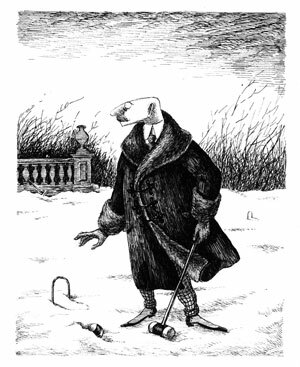 a Gorey illustration - one of my favorites. isn't this how you always envisioned yourself going to the opera? when i first saw the film in the early 2000's i didn't pay much attention to Margot's clothes, but her fur coat stood out the most for her character. revisiting the film now, i find it brilliant and hilarious that she wears her uniform of massive fur coat with a Birkin in most of the scenes. i'm relatively new to fur, but for the real stuff i'm a staunch believer in buying vintage - there are so many amazing vintage gems (stoles, cropped jackets, etc) to be found at quite affordable prices on Etsy. what do you think? 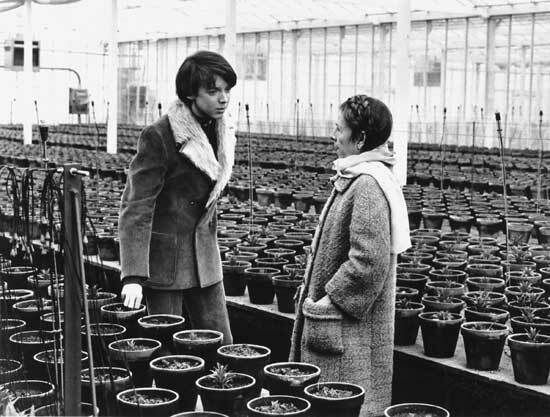 and have you any random or quirky style inspirations from film or elsewhere? I love it! I'm totally with you about buying only vintage fur. The new stuff is both expensive and wasteful. Recently, I've been searching etsy for a fur collar. However, I'm still on the fence about entering the world about fur owning. Maybe its because I was a vegetarian for 10+ years. 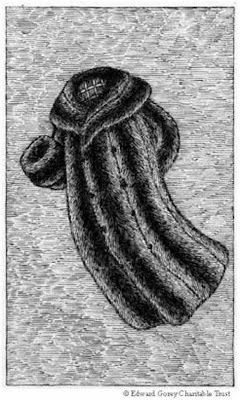 Thank you for posting the Edward Gorey illustrations. I had forgotten about him and love the inspiration (love Neil Gaiman too!). I cannot ever wear fur here ... the hippies have a fit if you do not correctly compost, let alone wear something like fur. However, fur brings back memories of my mother ... she loved fur and would wear it in the most casual way sometimes. Since I never had any pets, I would always pet her furs! I'm pretty sure I gave them away when she passed away, but I wish I hadn't ... that's the ultimate "vintage" fur, right? Such a wonderful post. 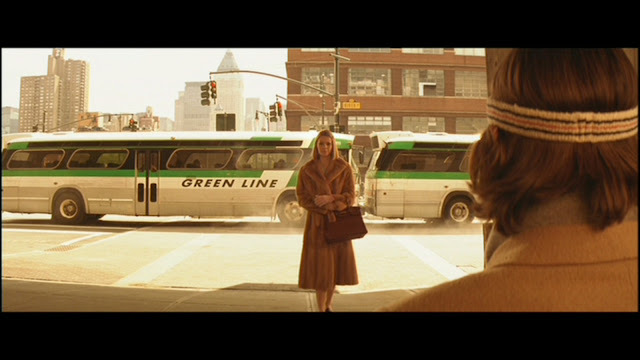 The Royal Tenenbaums is such a stylish film, my favourite Gwyneth Paltrow performance. And such a sad, beautiful and funny film. I suppose I look to a lot of Audrey Hepburn films for inspiration, the ease with which she dressed is so appealing. I don't really dress like her, but I like her charm and her commitment to a look. Just as I like Katharine Hepburn's wit and vulnerability and her commitment to a look. That Carine Roitfeld interview was very good, by the way! This is very interesting, thanks for sharing this! It's interesting to trace back the things that shaped one's aesthetic, especially when it's not directly "fashion." When I was young on Saved by the Bell the college years, I remember one of the characters was wearing a black sweater over a white ruffled blouse, I've always liked the look since. jennifer: i understand your hesitation - i thought a long time about the fur issue and i think i've made my peace with buying vintage. it's a thorny issue, but i think so long as one buys vintage fur in a responsible way, it's not that much different than buying a leather jacket or handbag. the ins and outs of understanding the quality issue and how to suss out/maintain quality vintage fur, on the other hand, is a whole other thing! S: your mother's furs sounded really amazing! ha, i can see why it can be problematic to wear fur depending on where you live. i'm still self-conscious about wearing fur (real or faux) during the day, and currently only wear it out at night. i'm always quite envious and admiring of families that have amazing heirloom or vintage pieces. it's always the personal history and the spirit of passing down a beloved item that makes it the best kind of 'vintage find'. ammu: isn't it such a great film? i don't think the aesthetic brilliance of it sank in until a few years ago. it's my favorite GP performance too. she just shines and embodies Margot so sincerely. my fave style films for Audrey is Breakfast at Tiffany's and Roman Holiday. and i do think there is something special about Carine - she has a crispness to her way of speaking and expressing herself that i can't help but like. and i like the fact that she has mentioned that people often mistake her shyness for snobbery or aloofness. something i can definitely relate to. pret a porter p: i loved watching Saved by the Bell! i didn't catch on to the college series, but as a kid, i definitely thought Zach and Kelly were the epitome of all-american style! I love this post, thanks for sharing his work, it's something new to me. I love your train of thought into the Margot pictures too. Gwyneth Paltrow's older movies always made me sit up straighter and wish I was better dressed: I love Sliding Doors and The Talented Mr Ripley. I also loved the outfits in Romeo and Juliet (Baz Lurhmann version) - so cool. I remember Julia Roberts' brown polka dot dress in Pretty Woman - I found it so chic. Uma Thurman was also really chic in Gattaca (I think the wardrobe was Donna Karan) and of course she was the sexiest thing in Pulp Fiction. From books, I was always imagining what the clothes in I Capture The Castle looked like. there's something funny about how fur is associated with eccentricity in all of these arts/literary references. 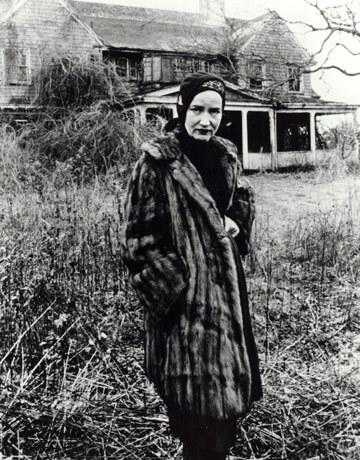 i mean fashion is now welcoming fur back from its passé status in the 90s...but i'm always kind of fascinated by old photos of slightly enigmatic women in fur, and the emotional reactions and judgments (positive and negative) that wearing it continues to provoke in people. have you seen this yet? kind of amazing.